The 45 Rotary clubs of Rotary International’s District 5710 have come together to support Heart to Heart International’s disaster relief efforts in Texas and Florida. Immediately after Hurricane Harvey devastated the gulf coast of Texas with over 51 inches of rain, followed by the damage caused in Florida by Hurricane Irma, Rotarians opened their hearts and checkbooks to help. Rotary clubs have been involved with the Lenexa, Kansas based Heart to Heart International (HHI) since its inception in 1992. Many of their founders and some of their board members are Rotarians so there is a natural connection and interest in supporting their mission. Initially, 5710’s District Governor Adam Ehlert asked that each of the 2400 Rotarians in the District give at least $5.00 which was matched with District funds. 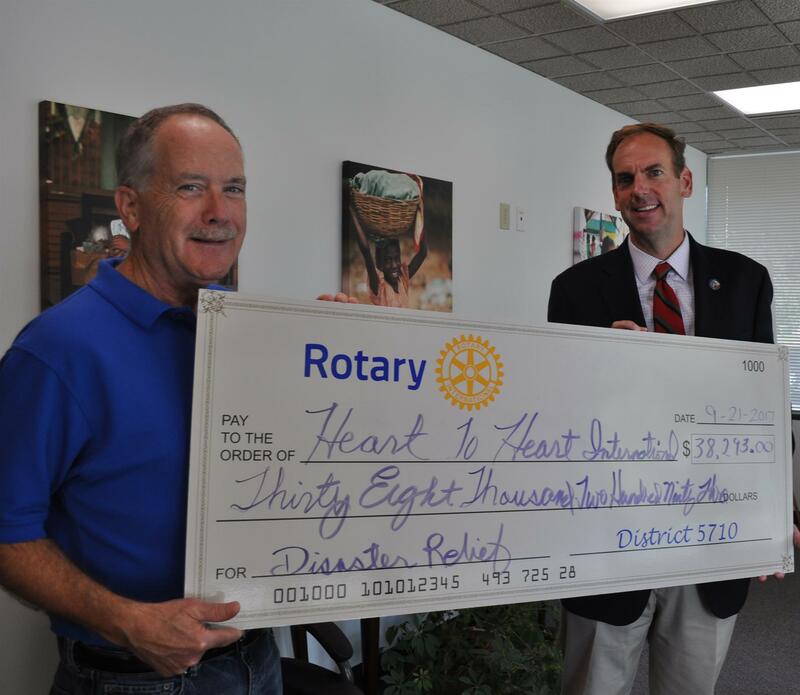 Ehlert said, “I am overwhelmed by the generosity of Rotarians in our District.” “To date, over $38,293 has been collected and an additional significant amount given directly through Heart to Heart’s website”. “Rotary International is the world’s most significant service organization, but we are not a relief agency. Heart to Heart is, and it’s our privilege to support them.” added Ehlert. medical volunteers are on their second tour following a short break at home. These services are provided at no cost to patients. Likewise, in Florida, HHI is the only organization providing emergency medical care to residents and responders in the area of Big Pine Key.